BTB's first release on Boltfish Recordings is a jittering and melodic EP of IDM and broken beats. 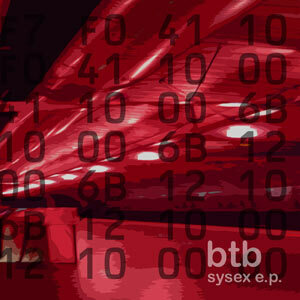 ""Sysex EP" is the latest solo release on Boltfish (DEC 2005) and was produced by Boltfish newcomer Btb. The seven-track EP would appear to be directed toward the open-minded dance floor. The sound is not a revolutionary one and it does contain some obvious musical references, but it still is beat driven electronic music filled with melody. The first track’s "Valentine" it is followed by "Midodi" is a 34 second interlude bridging to "Vip" features dry and metallic beats and atmosphere enhancing melody. It’s a good track and probably also my favourite on the "Sysex EP". "Tykha" is a lighter affair building on straight beats and nursery rhythm like melody and vocal samples. "Mimomi" has playfulness to it and is filled with electronic music nostalgia of the good kind. "Retek" rhythms based on glitch and steady yet understated bassline, loops effectively nostalgia factor rising high as well. In "GnC" things settles down and a beatless ambient affair finishes the EP, clocking in at 02:14 min it’s a bit short. Boltfish 22nd release and Btb’s first on Boltfish in any event is an enjoyable electronic experience if you don’t mind a bit of nostalgia." "BTB is the alias of solo musician Franco Colombo, who is currently based in Buenos Aires, Argentina. Having been around a few years now (his debut for Fuga Records came out in 2001), Colombo has fine-tuned his mix of electronica styles into a fairly unique hybrid. BTB crafts his music using harsh broken beats and rough glitchy sounds, yet he manages to stay fairly upbeat and fun most of the time, thanks to his playful use of melody. His mix of intense rhythms works surprisingly well against the more tranquil synths. Vip R sees Colombo using the digital percussion of randomNUMBER and thick, warm basslines. Tykua has a nice loop of cute bouncing synths not too dissimilar to a lot of the Static Caravan artists, while the hip-hop inspired drums and cut-up vocal samples sound as inspired as Tomcats In Tokyo. Serene sections come courtesy of closer GNC, which is a slow burning ambient number. The swampy production of Retak is a sound experiment fuelled by static crackles and muffled, tumbling stretched kick drum. Interlude Mimomi has the percussion and xylophones of early Minotaur Shock, while the breather Midodi is a brief sound collage of clock chimes. All in all, a nice mix of different styles and influences makes Sysex one of the most enjoyable electronica EP's this year. Nice one Boltfish." "Organic electronica has come a long way in the last year, in no small way due to the wealth of small underground labels working hard to develop the music scene. Boltfish continue this crusade with yet another stunning EP. Seven tracks to enjoy here, all perhaps a little fuller in their sound than pervious releases. ‘Midodi’ has a fun fair feel, with twisted electronica adding a chaotic touch. ‘Tykua’ returns to a gentler vibe, with delicate chords and solid beats, distant vocal touches and a robotic element create a smooth, soothing sound."